What We Do | Camisasca Automotive Manufacturing, Inc. Designed and engineered to meet the same OEM quality standards, today we offer many great lifestyle products to auto dealerships, tuners, car clubs, and corporate America for use in advertising, promotional and commercial gift programs. With attention to detail that will last for years, our products afford long term quality advertising of your corporation or brand. Specializing in stainless steel license plate frames and precision CI graphic presentation, our line of quality-driven products has grown to include license plate mounting brackets, wheel centers, and a variety of exterior and interior badging. Our state of the art Lake Forest, CA production and distribution facilities can meet all your volume requirements for both vehicle inclusion and lifestyle programs. 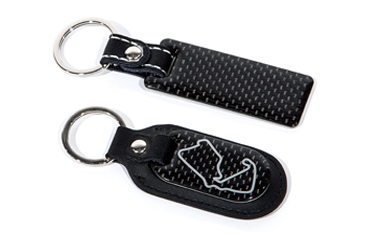 All of our classic lifestyle foundation products from stainless steel and carbon fiber license plate frames, keychains, and logo valve stem caps, to our newest offering of “Classic Car and Race Track Coasters” are available at competitive wholesale pricing for both instore and online retail sales channels. Not yet ready to promote your business, but see yourself as a brand advocate? Shop a selection of our bespoke accessories through our newly redesigned online store.